Caring for an older disabled relative can imply practical, financial and emotional challenges. In March 2015 we started a Home Care Course in Velenje. The purpose of the Course was to teach family members how to care for older relatives. By June, over 70 people had completed the course. 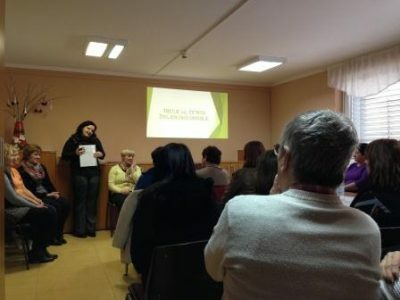 The course was organized and financed by the Municipality of Velenje and taught by specialists of Elderly Care Home Velenje. It was free of charge for participants. Course participants realized what a good relationship and communication with older people really look like, and why dementia is known as cancer of modern society. Furthermore the course provided ideas on strengthening the social network of older people. Some participants had never heard about palliative care before participating in the course. Specialists demonstrated practical instructions and skills for better care. The next round of the Home Care Course is in preparation -more than 20 applications have already been received. Next steps include setting up a Family Carers Club. The main goal of meetings will be to exchange experiences, provide mutual support and the opportunity for family carers to share their feelings, talk about the good and sad things that they are facing while caring for their older relatives. Details on older people's involvement: The Course did not only attract young people who care for their parents or grand parents, but also older people and older couples who are not involved in caring. They needed to know more about dementia or wanted to gain information about home care. ""You never know when you will need those skills,"" they said. Feedback was positive, people recommend the Course to their friends and this is the reason we are continuing with the course . We will run another course in October 2015 and Family Carers Club in September 2015. We would not change anything. We talked a lot about dementia and its consequences. Participants wanted to see the Dementia Department in the Elderly Care Home Velenje and a meeting at the Dementia Department could be arranged.